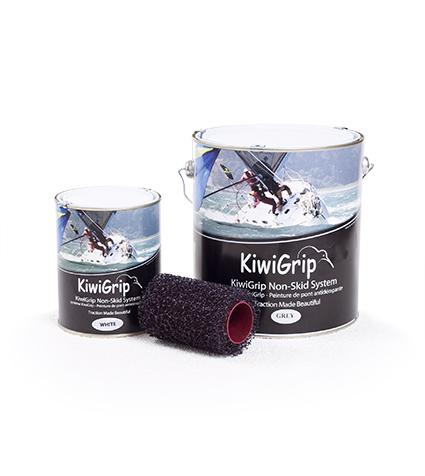 KiwiGrip is a revolutionary, durable, non-skid coating that spreads quickly and easily with our proprietary roller, offering a beautiful, high traction surface. By varying the application technique, the texture can be adjusted from a rolled "pleasure boat" texture to an industrial aggressive "work boat" texture. As a homogeneous material KiwiGrip doesn't suffer from the problems encountered with products filled with sand, walnut shells, beads, rubber fleck, or other fillers. Coatings with fillers tend to wear through, and the fillers fall out leaving an unsafe deck that's hard to clean and even harder to re-coat. Loaded with a UV stabilizer for consistent color. Available in four standard colors, white, cream, gray and blue.